Microsoft this week announced the launch of XBox music, a blended music subscription, personalized radio and download service available on Xbox, Windows mobiles and tablets, and soon Windows 8 on PCs. Microsoft does not have the strongest of track records in digital music, with ill-fated previous efforts such as MSN Music and Zune. However this latest foray could possibly, just possibly be a game changer. In fact there is an argument to be had the what Microsoft have done with Xbox music is what Apple should have done (should do?) with iTunes. But this isn’t what gives Xbox Music such disruptive potential and indeed Apple won’t be overly concerned yet. Apple has managed to make music work in a way that no other device company has because it exercised near absolute control across its tightly integrated ecosystem, from top to bottom. Microsoft might be able to exercise that sort of control on Xbox, but nothing close to it on phones, tablets or PCs. So do not expect Xbox music to turn Microsoft into a music device and service powerhouse that will usurp Apple. So just where does the disruptive threat come from? From the little old PC. In my view the boldest move Microsoft have made here is to commit to hard bundle free streaming music with Windows 8. Think about that for a moment. Every single copy of the latest update to the world’s most ubiquitous PC operating system will have a Spotify equivalent included for free. The last version of Windows will have shipped 350 million units by the end of this year. When you start looking at that sort of scale Deezer’s 26 million users and Spotify’s 24 million users start to look positively modest in comparison. Microsoft have not yet revealed details of how many weekly hours of free music a Windows 8 free music user can expect to get, but have stated that the allowance will scale back after 6 months, which suggests that the initial allowance will be meaningful. Which of course is hugely disruptive to the incumbent streaming services. Suddenly a competitor’s massive marketing funnel will be preinstalled on the PCs of their target and existing customers. Microsoft will have paid handsomely for this free music allowance and it should be viewed as a hard cash investment in Steve Ballmer’s recently publicly aired mission to ‘make Microsoft cool’. Microsoft needs to join its organizational dots. Part of the reason Microsoft’s previous music initiatives faltered is because it failed to break through its internal organizational silos. For example, the last time Microsoft launched a streaming music service (via MSN) it wasn’t compatible with its Zune music player or Zune store. Xbox looks like a brave effort to join the organizational dots, in much the same manner as Sony Music Unlimited, a brave effort to try to follow Apple’s iTunes model. Both Sony and Microsoft will have to reverse decades of organizational thinking and process if they are to truly transcend their organizational silos. The user journey has to be truly seamless. Consumers have long grown weary of bloatware shortcuts on the desktops of their newly purchased PCs, attempting to entice them with 3 months free trial of some service or another. Microsoft will have to make the user signup and activation journey for Xbox music truly seamless and as deeply integrated into the Windows experience as is possible. Europe may not play ball. One key force will pull against deep integration: regulatory oversight. In 2004 the European Commission expensively forced Microsoft to unbundle Windows Media Player from Windows and to pay a massive $761 million compensation package to Real Networks. And that was just for hard bundling a music player. How will the European competition commissioner look at a hard bundled US music service that could seriously disrupt two European streaming music services (Spotify and Deezer)? So Xbox music has the potential to be a game changing play, bringing digital music to the non-Apple masses. But Microsoft will have to get over itself and some major market challenges first to fulfil that potential. Walled gardens, Ecosystems, Platforms, call them what you will, but the mechanisms through which our digital content experiences are managed have evolved much over the last 15 years. In the early days of the web, ISPs tried to control our entire online lives by building proprietary walls around users. These so-called Walled Gardens were exemplified by AOL. But as Internet users got savvy they banged away at those walls until they crumbled under the weight of inevitability in much the same manner as the Berlin Wall did. Mobile carriers briefly brought Walled Gardens back from the dead (and there’s still an extended death rattle in some parts), but these days we expect our Internet journeys to be broadly free. I say ‘broadly free’ because of course many of the destinations on our digital journeys are not open, and some of them are harder to get in and out of than others. In fact the journey of the digital consumer is analogous to that of a traveller in Medieval Europe. The highways are sometimes wild and unpredictable, while the coveted destinations are walled cities and heavily fortified castles. The reasons the walls exist in the digital realm are not entirely different from that of Medieval Europe’s mercantile cities. Walls protect their inhabitants from unwanted external intrusion, but most importantly they guarantee those inhabitants a quality of existence that could not happen externally. This is why ecosystems are the success stories of paid content. The xBox, Kindle and iTunes ecosystems have all succeeded in converting portions of their users into paid content buyers at rates unachievable elsewhere. As many a newspaper will tell you, simply throwing a pay wall up around your content doesn’t magically create a loyal paying audience. The reason that iTunes et al work is because the priority of their walls is to create and guarantee a quality and consistency of experience within them. Protecting against external intrusion is of secondary concern. Once you have created a high quality experience within those walls, then you can start thinking about leveraging revenue. Just in the same way a successful Medieval city state that could guarantee prosperous trade and commerce within its walls could also demand greater taxes from its subjects than one that could not. Take the example of xBox Live, the networked gaming component of xBox. When the service was first launched it was a gimmicky extra. But when, years after launch, Microsoft turned off access to Live to xBox users who had pirated games on their consoles there was a massive outcry from jilted (pirate) users who claimed that their xBox experience was useless without Live. What Microsoft had done was use the confines of their ecosystem to create a unique experience that could not exist externally and of which users quickly realized the emotional and monetary value. But as successful as closed, device-based ecosystems are, things are changing, quickly. We are seeing the emergence of a new breed of ecosystem that doesn’t have the straightforward mechanism of a device operating system to define its boundaries. Instead this new generation of ecosystem almost paradoxically uses openness to create its closedness. These ecosystems use software developer APIs to create vibrant platforms in which a quality of experiences exist. Nobody exemplifies this approach better than Facebook with their Socially Optimized Web Strategy. The net result is that we now have three key types of Content Ecosystem Models co-existing (see chart). Closed Door Ecosystems: these have the most impermeable walls, typically defined by the operating system of a family of devices. Apple’s iTunes is the best of breed example. User experiences and all externally developed experiences (typically Apps) can only exist within the ecosystem of supported devices. One Way Ecosystems: these leverage software applications to define boundaries, but unlike Closed Door Ecosystems they do not have the benefit of proprietary hardware so rely upon the quality of the experience delivered by the software. To help achieve this, One Way Ecosystems leverage developer communities via APIs. This enables bite sized chunks of the ecosystem’s experience to be delivered externally, though almost always with a view to ultimately encouraging users in, or back in, to the centre. Control is exercised by ensuring that a core level of experience, and Apps, can only be experienced internally. A contemporary example is Spotify, who already support some externalization, but last week announced the creation of an internal, closed wall API platform. Thus Spotify aims to benefit from the external reach of the API era while simultaneously reaping the rewards of the Closed Door model. 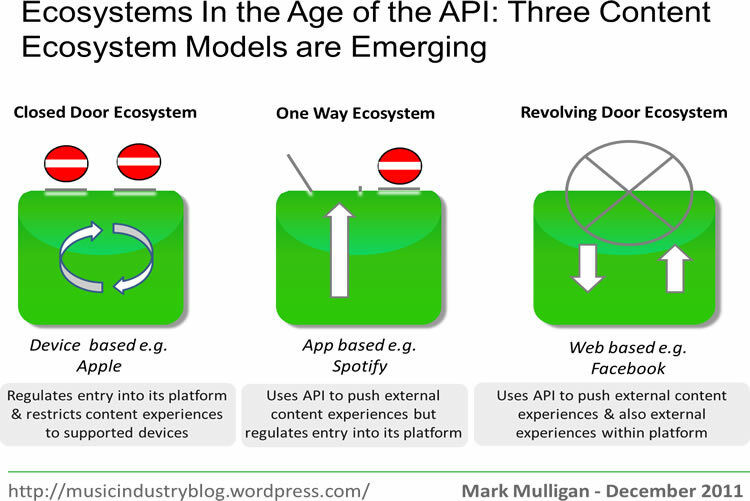 Revolving Door Ecosystems: these are the true child of the API era. Typically they exist without an OS or other proprietary software to define their boundaries. Instead they leverage APIs to deliver a subtler but highly effective ecosystem that fully supports inward and outward flows of externally developed experiences and Apps. What protects these ecosystems from disintegrating under this laissez-faire approach is tightly policing the flow of data, so that the ecosystem’s data and context is depended upon entirely to deliver the value of Apps and other experiences. Facebook isn’t the only example of this approach but is simply leagues ahead of anyone else. The secret ingredient of success of any ecosystem is uniqueness, a monopoly on control of uniqueness. A uniqueness that consumers know they cannot experience anywhere else. However uniqueness isn’t just valuable for the technology companies building ecosystems, it is a crucial commodity for media companies in the digital age. Piracy and the wider Internet swept away media companies’ monopoly on supply, so now uniqueness is the most important tool they have left to create new senses of monetary value among audiences. Only when uniqueness has been achieved, can other important assets such as context, convenience and curation be fully brought to bear. It is easy to fear ecosystems (indeed there is much to give cause for concern) and there are growing issues about how competing ecosystems will co-exist (if at all). But they are also the key to successfully monetizing content in the digital age, and they will continue to evolve. Devices transformed Walled Gardens into Ecosystems, and APIs have transformed Ecosystems into Platforms. Change will inevitably continue at a bewildering pace, but the challenge which media companies must rise to, is to become active participants in, nay, catalysts for that change, not shell-shocked observers.